Please Call to book your trapeze class. During your class, we will coach you through our beginner friendly position, called a knee hang. After the knee hang, you will be instructed to do a back-flip dismount into the net. There is a safety device that travels up the ladder with you. 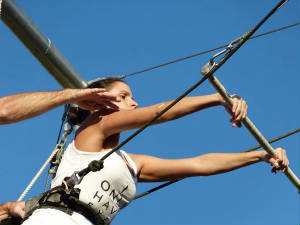 All participants are in safety harnesses and safety lines, with a trapeze safety net below. 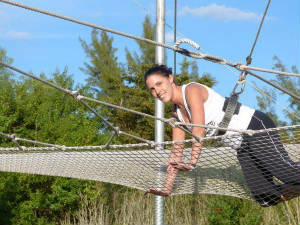 There will be ATA Staff at each station of the trapeze assisting you every step of the way. You'll have several opportunities to master the skills necessary to succeed. At the beginning, we have a quick orientation. You will practice with a low practice bar located close to the ground with an instructor. An ATA Staff will give you a visual demonstration of what this all looks like up in the air before you go. At the end of the class, you will have the opportunity to do one mid-air transfer with a professional catcher if and only if your "ready" for the catch. In order to be "ready" for the catch, You must hook your knees in the right timing and take your hands off when we say. If you are not "ready" for the catch. You'll have 4 turns on the trapeze to master the skills necessary to succeed to be "ready" for the catch. Who Can Learn ? Anyone in good general health with a spirit for adventure can learn to fly with us! Weight Limit 250. No experience necessary, beginner friendly. Ages 4 and up, fun for the whole family! Train Recreational with flying trapeze. Its a great exercise! What Do We Wear ? Ladies: No low cut shirts or tops please, sports top or t-shirts are ideal. Please bring ankle or taller socks and tie your hair back. Men: Athletic shorts. Please bring taller socks, weight limit is 250 lbs. Not recommended: Jeans, sweatpants, windpants, chewing gum, jewelry as in rings, dangle earrings, and big necklaces. No sunscreen, oils, or lotions of ANY KIND, please. Please bring water to stay hydrated, all circus activities are outdoors. We also sell water for $1. All participants must sign our waiver in order to participate, under 18 needs a parent. Camera, Video or Go Pro! Try to have proper helmet or chest mount. Head Straps work sometimes if they are tightened. Socks! Everyone wears socks when we FLY! Please arrive 15 minutes prior to class time. We will start on time with a brief orientation. 24-48 Hour Cancellation Policy: Fee up to class price if not canceled in time. Class lasts 1.5 - 2 hours depending on the class size. There can be up to 15 people per class. Please expect to stay the whole time. We take a class photo at the end that you can get! Bring your friends to watch and take pictures. If you have a friend that is interested in joining the class, Bring Them! Weight Limit is 250 pounds. Thank you. You may be considered "advanced" if you have previously taken our intro to flying trapeze class or have successfully done a knee hang catch. During your lesson, we will start with a static low practice bar warm up. We then will continue where you left off from your last flying trapeze class. Learning new tricks as you go. 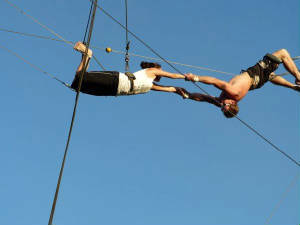 There are many tricks to learn on the flying trapeze. At the end of class, you will have the oppertunity to go across to a professional catcher with your new trick if your ready for the catch. Classes cost $50 for learning advanced tricks. Advanced Tricks can be learned in our All Levels or Beginner Classes. There will be no discounts or coupons taken for advanced flyers learning anything other than a knee hang. The staff of Aerial Trapeze Academy are trained to bring the thrill of flying trapeze to everyone!